What Is The Definition Of Quiver In Archery? 1. This container is used to hold arrows near or on the archer’s body. 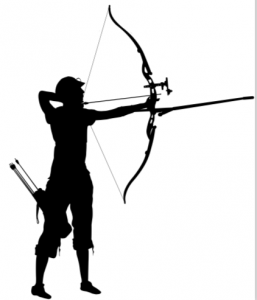 Quivers are made to be worn at the waist or on the archer’s back and were originally designed for hunting. There are also quivers that rest on the ground that can be used when the archer is shooting from a fixed location. Quivers can also be fixed onto the bow, but they are limited in the amount of arrows it can carry. How Many Arrows Can Be Held In A Quiver? 1. The amount of arrows would depend on the size of the quiver and the length of the arrows. Quivers that are fixed to an archer’s bow tend to carry three to seven arrows. On average, it appears most archers carry between three and six arrows, max. The number of arrows would also depend on what the archer is doing. For example, if the archer is shooting for practice or is hunting. 1. The archer reaches down into his quiver and pulls out an arrow with beautifully colored feather fletching.